In the said case, the bicycle handlebar had injured the lower abdomen and symptoms started 2 days after the trauma with the diagnosis of perforated suppurative appendicitis in pathological examination. Although the reasons why colonoscopy increases the risk of appendicitis remain unclear, the article offers some theories, including asking if bacteria within the colon are altered as the bowel is prepared prior to colonoscopy in ways that increase the likelihood of inflammation. In this article, we present our institution's MR imaging protocol for evaluation of suspected appendicitis in the pregnant patient and illustrate the MR imaging appearance of both the normal appendix and spectrum of appearances of acute appendicitis seen in pregnancy. 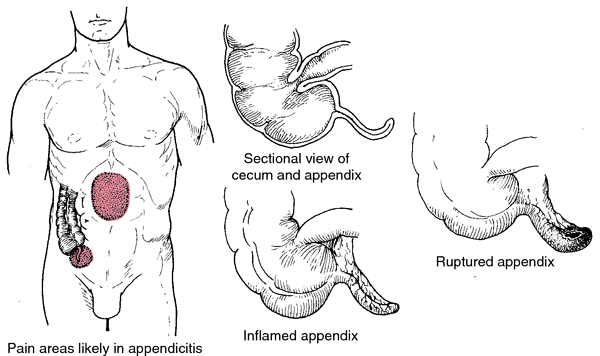 Acute appendicitis is one of the most common abdominal surgical emergencies, with a lifetime prevalence of approximately one in seven1. Keywords: Acute appendicitis, Leucine-rich alpha-2-glycoprotein-1, Abdominal pain, Emergency department. This study is done to evaluate the association between hyperbilirubinaemia in cases of acute appendicitis and its complications. In the antibiotic group, 186 of 256 patients (70%) treated with antibiotics did not require surgery; 70 (27%) underwent appendectomy within 1 year of initial presentation for appendicitis (JAMA. Histopathologically, acute appendicitis was detected in 125 (80. A raised CRP in appendicitis has not only been shown to be a good predictor of appendicitis but is also directly related to the severity of the inflammation. Pericecal inflammation, abscess formation, fluid in the right iliac fossa, cecal wall thickening, and an ileocecal mass may be CT findings in SA, which are similar to those in acute appendicitis. sup] Although patients in the known setting of AML who develop abdominal pain after receiving chemotherapy are often found to have suppurative appendicitis after surgical intervention, acute leukemic appendicitis as the initial manifestation of AML proven on pathological review is even rarer,[sup], and early recognition is difficult, especially when there is no obvious blasts in the peripheral blood like our case. Patients: A retrospective chart review was carried out on patients who underwent SILA for acute appendicitis from June 2012 to August 2015 at the Ehime Rosai Hospital in Niihama, Japan and Saiseikai Shimonoseki General Hospital in Shimonoseki, Japan.